This is a really clever idea (and so super-personalized) for a rustic wedding, shabby chic wedding, or a barn or country theme wedding. Mason jars with photos in them are also a really smart way for displaying pictures at an outdoor wedding if there is a concern that the wind could blow picture frames over. (And let’s face it, there always that concern!). 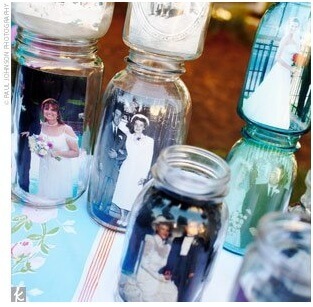 The mason jars will keep the pictures safe and adds a touch of the unexpected. 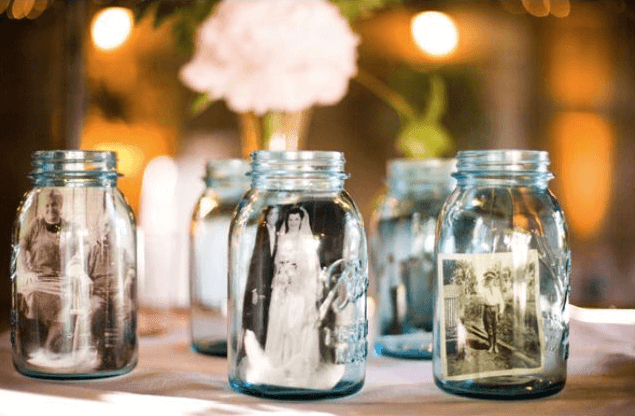 There are so many ways to work with this idea for displaying pictures in mason jars at your wedding reception, whether you choose to display only pictures of yourself and your fiance, or whether you use the mason jars to also display vintage photos of family members on your wedding day. Just picture a collection of mason jars lined up on a table at the entry to your reception, with each jar featuring a vintage photo of important family members, as pictured above. Or you could display a series of mason jars with pictures of your and your fiance at various stages of your lives – from the time you were little kids, right through to your engagement (see below). So many ideas! Gather as many mason jars as you can, and into each insert a black and white photograph of the two of you. [Photo Credit: Theary Meak Photography]. 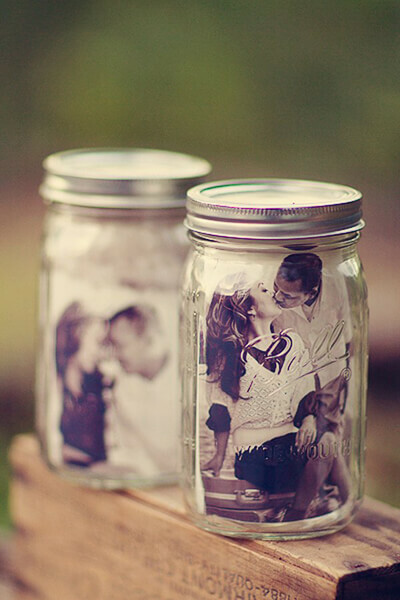 You might want to use your engagement photo in each jar, or alternatively you could use a different photo in every jar. Still another idea would be to use a wedding photo of older relatives in each jar – for instance, wedding photos of your parents, grandparents, etc. See the picture below from beautyandbedlam.com to get the idea. Place the jars on your reception tables for the most personalized table decor ever. 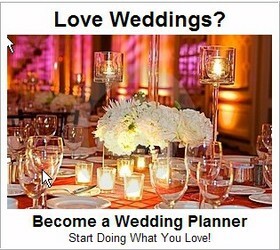 Or you could position one jar at each place setting and let guests take them home as wedding favors. Be sure to carefully position the photo in the jar so that it doesn’t get damaged or folded as you insert it. And adjust it so that the photo it is pressed up against the walls of the jar and clearly visible to onlookers. Give your Mason Jar Photo Holders an Authentic Vintage Look With this Little Trick…..
Want to get that slightly golden, aged vintage look happening? Here’s how to do it. The secret is… vegetable oil! Yes, like the kind you cook with. Any vegetable cooking oil will do. 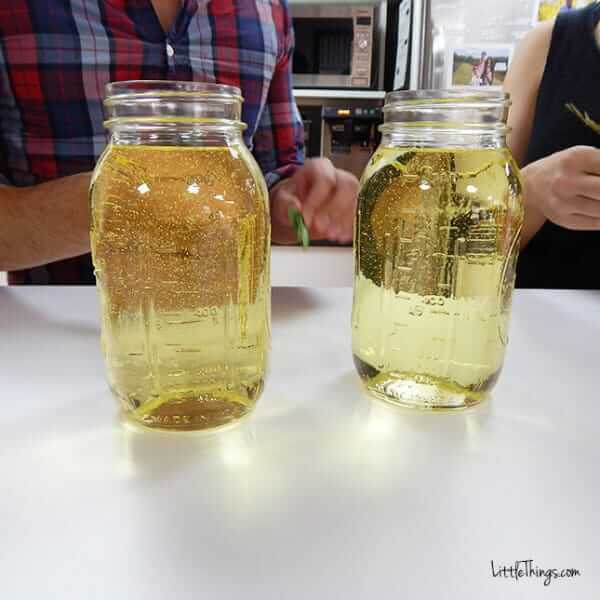 Fill each jar with vegetable oil (do not fill above the bottom lip where the cap screws on, or the oil may leak from the lid). Now here’s where you can get even more creative. 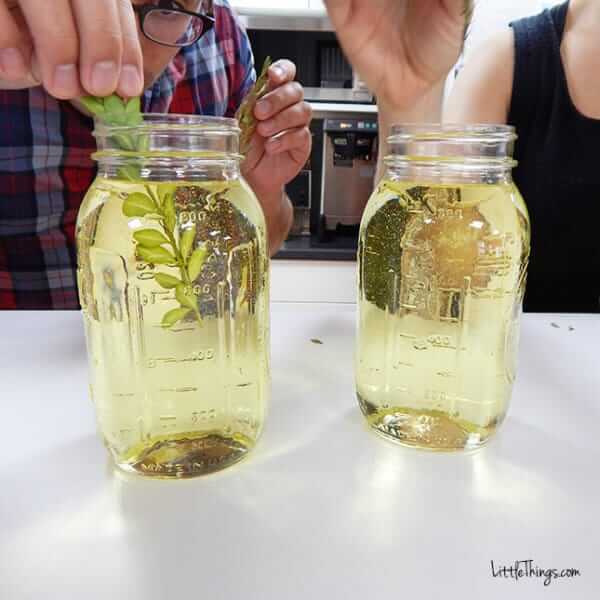 Kick up the look by adding some greenery to the oil in the jars – the decorative greenery will sort of float suspended by the oil and will sit behind the photos in the jars, so that even when guests view the jars from the back, they’ll be pretty to look at. 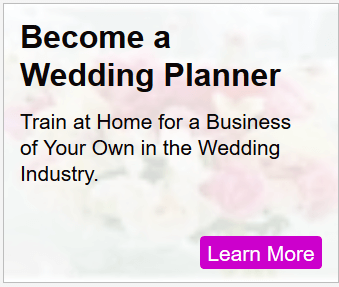 For this you can use any kind of greenery that strikes your fancy…. green ivy could be a good choice since ivy, in the “language of flowers” (known as floriography) is very symbolic for weddings… ivy signifies fidelity. Eucalyptus could look pretty, or even a sprig of pine, spruce, cedar or juniper. Herbs are another option, like a sprig of thyme. 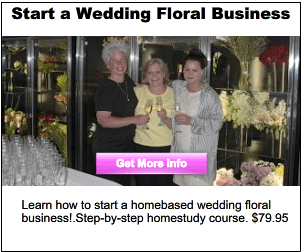 Better still, Rosemary (another herb) would be very appropriate because the herb Rosemary is a symbol of remembrance (back to the “language of flowers again”), so its often used in occasions that should be remembered (like weddings and anniversaries). 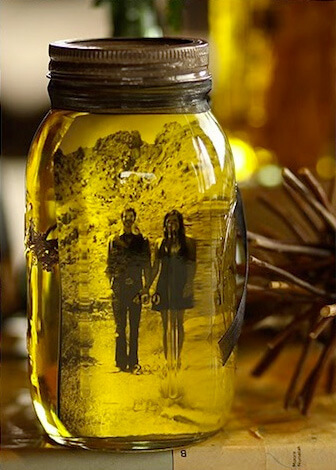 Symbolizing remembrance, its a perfect fit and very appropriate for jars displaying photos. Use as much greenery as you like. You can go with just one stem or sprig of greenery, or use more. You can stick with one type of greenery, or use combinations of a couple different types that look nice together. Berries from trees or bushes could be added as well if you are having an autumn or fall wedding when the berries will be in season. There’s nothing to stop you from using red or golden fall leaves while you’re at it – that could look spectacular. Seasonal elements like this would really help enhance the autumn theme. 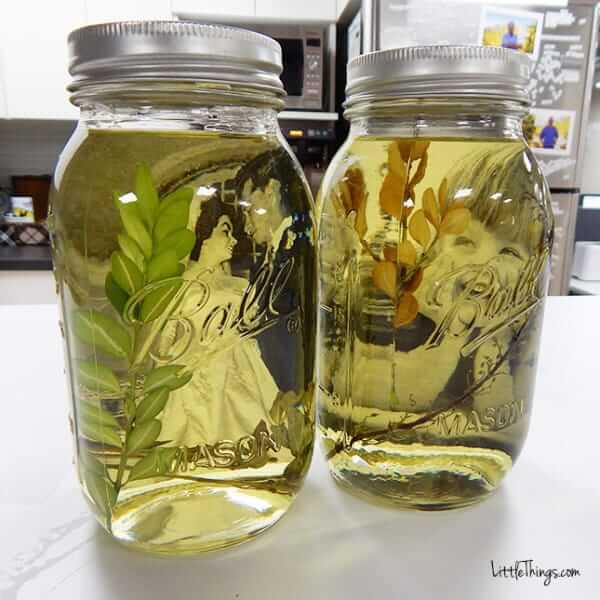 After you’ve gotten the greenery in place, its time to insert the photo into the oil, positioning it along the inside wall of the jar. Make sure you position it correctly, with the actual picture facing outwards. Take a breath and don’t be nervous. You might think that the photo will get damaged, that the ink will start to run, or that the photo will dissolve, but fear not. The photo will be fine, it will simply start to take on that warm golden glow that gives it that beautiful vintage look. If you are using a smaller photo, you can position it more towards the center of the jar if you want, rather than up against the wall of the jar — the oil will help hold the picture it in place. See! That’s how the get that golden vintage glow! Candy Sprinkles Wedding Ideas – Lots of Photos and Ideas!